Sri Lanka's win over defending champions England was rated as the biggest upset in the history of the Women's World Cup by BBC Sport commentator Alison Mitchell. And there were other commentators who regarded the victory as one of the biggest upsets in all forms of cricket, including the men's game. It was the biggest run chase in the 16-year history of Sri Lanka's women's team, and the first time they have won a World Cup match against a higher-ranked nation. Until then, Sri Lanka, who take on New Zealand in their first Super Six match on Friday, were regarded as one of the weakest teams in the tournament. 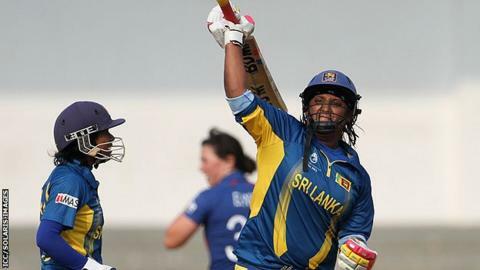 "I think it was the most happy and fortunate day of my entire career," skipper Shashikala Siriwardene told BBC Sinhala. It was the first time a complete women's game was shown live in Sri Lanka. "Our relatives told us that all Sri Lankans were glued to television screens," says the delighted skipper. However, a team that relies on their bowling and fielding, rather than batting, collapsed during their next group match when the superior physical strength of the West Indies batters secured an emphatic victory. But the fans were once again glued to their television screens to witness their team knock hosts India out of the tournament on Tuesday. The country's president, Mahinda Rajapaksa, was among them. He called the team on the phone immediately after the match to congratulate them. "Suddenly it is all about the women, there's a big buzz," says the BBC's Azzam Ameen in Colombo. "Once they return they will be celebrities here." But what is the main reason behind their sudden success? It is mainly their commitment, in addition to hard work by coach Harsha de Silva, that has paid dividends, according to Sri Lanka's World Cup-winning men's captain Arjuna Ranatunga. "The women's team is an example for the men's team and their commitment is a lesson to some senior players in the men's team," Ranatunga told The Island newspaper. It is the same team, apart from two members, that played in the World T20 hosted by Sri Lanka in 2012. "Although there is no major change in the team, there seems to be a sudden change in their approach," Channaka de Silva, sports editor of the Daily Mirror told BBC Sinhala. The team captain Siriwardene agrees. "We have been mainly focusing on our psychological strength. We focused on yoga, for example, and the whole support team, together with the manager and the coach, focused on a new approach rather than a new team," Siriwardene said. The team morale is also boosted by the fact that the tournament is held in the region. Sri Lanka's skipper hopes that their success will not be a "mere coincidence" but a continuing trend, and that fans will not only focus on the men's game but on theirs too. A journey that began about 16 years ago has not been rosy for Sri Lanka's women cricketers. They were only recently offered match allowances and part-time contracts by the Sri Lanka Cricket Board, but they are paid significantly less than their male counterparts. As a result, almost every member of the team is working for the country's armed forces. They have no military duties, though, and are allowed time for training. From now on, it certainly looks like that the future is bright for Sri Lanka's women cricketers. In 1996, Ranatunga led the men's team to a World Cup triumph that changed the fortunes of not only cricket but also society. Their victory made Sri Lankan cricketers worldwide stars. The money started pouring in and countries that regarded Sri Lankans as minnows began respecting the small players with a strong morale. As Abhishek Purohit points out on Cricinfo, the temptation is to compare the women's success to that of Ranatunga's team, but it is too early to predict for sure. In a conservative society that does not actively encourage young women to pursue a career in sports, the World Cup success should inspire another generation of players. "Make no mistake, these wins will change women's cricket in Sri Lanka, forever," says Ranatunga. But, as Siriwardene kept telling me while covering the WT20 in Sri Lanka, the future will be bright only if the girls continue their winning form. Otherwise, their initial success in India will soon be forgotten.